There's a big gaping hole along the shoreline on the north end of Lake Union, directly across the water from where my own little floating home lies. Yesterday morning, a couple of tugs hooked on to the former Washington State Ferry, Kalakala and towed her though the locks, out of the lake and into the open waters of Puget Sound, bound for a slip on the Makah Tribal Reservation at Neah Bay on the northern tip of the Olympic Penninsula. 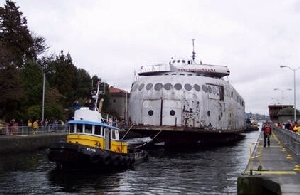 Once the pride of the State Ferry System, and for most of her active life the veritable symbol of the City of Seattle, Kalakala has spent the past five years sitting literally in limbo, while a group of dedicated individuals attempted to raise the $10 - $12 million required to undertake a full renovation of the cherished vessel. 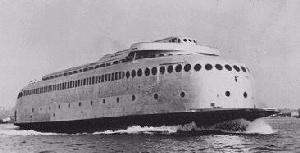 Built in 1936 out of the remnants of her previous incarnation, the steam-powered ferry Peralta, she was truly one-of-a-kind; a streamlined, gleaming example of the art-deco style of combining both form and functionality. Although she was said to ride like a bucking bronco under full speed, her graceful, curving superstructure made her look like her namesake, the "Swift bird" of Duwamish Indian mythology. Although she was out-of-service nearly 20 years before I permanently set down in Seattle, she was a much loved, much missed, and much remembered fixture of local history. Status as a "native" often was predicated on among other things having ridden the art-deco leviathon, and up until the construction of The Space Needle for the 1962 World's Fair, whenever someone brought up the subject of visiting Seattle, often she was one of the first things people remembered. 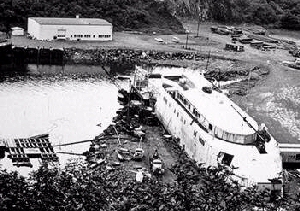 In 1984, a local sculptor by the name of Peter Bevis was wandering the docksides of Kodiak Alaska when he spotted the rusting hulk of the Kalakala mired in the mud, having spent the previous 20 years being used as a converted fish cannery. Abandoned by her previous owners, who had gone out of business, gutted of its once famed interior furnishings, the derelict was about to be cut up for scrap when Bevis came to her rescue. 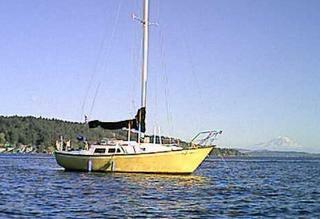 It took Bevis and a dedicated group of volunteers 14 years to purchase, clean, repair, repaint, and make the once proud boat seaworthy for a planned return voyage to the Puget Sound, and on 6 November 1998 she was paraded into Elliott Bay accompanied by a flotilla of sail, power and working boats, in an atmosphere that was tinged with equal portions of nostalgia and hope for her future. Bevis and the non-profit foundation he helped established planned to refurbish her to her former glory, then use the vessel as a floating museum, meeting space and perhaps even an elegant restaurant. Alas, the initial enthusiasm generated by Kalakala's return didn't translate into donations, and eventually she was moved from her berth at Pier 66 on the downtown waterfront to the north end of Lake Union, where she languished for the next four years until Bevis and his group was forced to abandon their ambitious scheme and put her up for auction. Potential buyers included a San Francisco entrepreneur (who planned to haul her south and convert her into a tourist attraction at Fisherman's Warf), but through a convoluted series of events, Olympia businessman Steve Rodrigues finally ended up with the papers, and yesterday morning he began the long trek from Seattle to Neah Bay, where he plans to continue restoration work, with the eventual goal of turning her into a waterfront attraction somewhere on the Puget Sound. I'm going to miss the old girl; she was a fixture on the Lake for my entire time here. Even in her somewhat ignoble condition, she still carried a sense of style and dignity in her graceful lines and gleaming hull, despite the splotches of rust and weathered paint that only covered but never diminished her beauty. On sunny days, she was the half-way point in a good hour-long kayak back-and-forth across the lake, when there was always time to take a leisurely circuit around and beneath her jutting main deck, like a tiny moth attracted to a 10,000 watt Kleig light. I hope I'll be lucky enough to see her make yet one more triumphant return, this time completely restored to her former magnificence, the flying bird once again taking wing across the grey waters of Elliott Bay. And when she does, hopefully, I'll still have my own little floating home from which to follow in her wake, to welcome her home again. (To learn more about Kalakala the foundation's website is still active.